For a second time a Paper Project image was selected as one of the winners of the Nikon Small World Competition - The opening reception was held at the Helen Mills Theater in Midtown Manhattan and marked the start of a 25 city tour. More information about the exhibit and the tour can be found at the Nikon Small World Web Site (opens in new window). The image is also the micrograph for the month of May in the 2007 Nikon Small World Calendar - Order information link (opens in new window). The distinguished judges’ for the 32nd Small World competition reflect excellence in scientific, educational and photographic specialties. They include among them a Nobel Laureate and the Science Photo Editor for Time Magazine. More information on the judges can be found | here |. 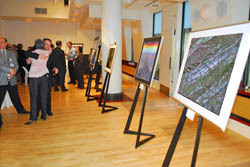 As with the previous Nikon Small World event in 2005, the reception was a hit with the guests.